B&O Play has a new wireless speaker, the Beolit 17 | What Hi-Fi? The Beolit 17 speaker is a portable wireless speaker with a rugged design and a day's worth of battery charge. Have you got enough Scandinavian style in your home? If not, B&O is hoping that its new Beolit 17 speaker, which follows the Beolit 15, will fill the gap. Design-wise, B&O has gone for a rugged look; the top and the bottom of the Beolit 17 is made of polymer, as well as having a non-slip and scratchproof tray on the top to place your smartphone. 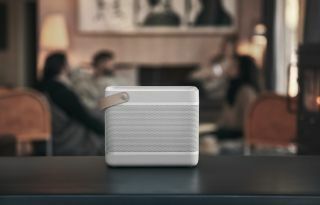 The speaker has an aluminium grille and a leather handle "crafted from premium grain", in case you want to transport it around. The Beolit 17 also has a "one-touch connect" button, which can activate one of four functions: setting an alarm to play one of two tones from B&O Play, or the last song played on your smartphone; playing the last song you listened to on Spotify; a remote function that will play, pause, or skip the current track; or activating one of the company's ToneTouch presets. The speaker comes in "Natural" (White) and Stone Grey, and is available now, priced £450.